Mushrooms can play a role in a dietary cognitive portfolio (one mushroom—the bay bolete—even contains theanine, the relaxant phytonutrient in green tea). Surprisingly, plain white mushrooms—the cheapest and most widely available variety—may work best and are among the most antioxidant rich. In fact, eating just plain white button mushrooms have been shown to upregulate IgA antibody secretion, and when eaten daily, may suppress breast cancer growth by inhibiting the aromatase enzyme. People suffering from autoimmune diseases, inflammatory diseases, allergies, overactive immune systems, and chronic inflammation may especially benefit from eating mushrooms. 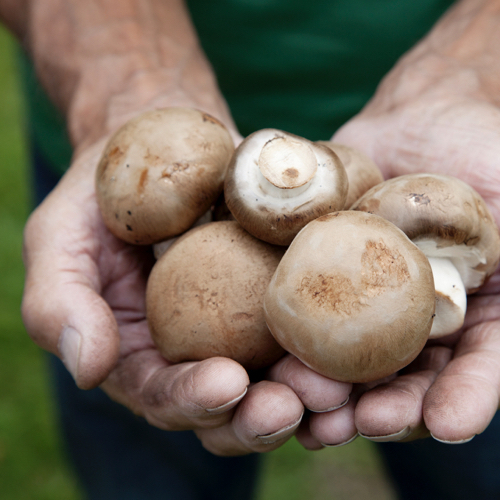 Mushrooms contain compounds called beta glucans, which may boost immune function. Sun-dried or U- irradiated mushrooms also contain vitamin D2, the same type of Vitamin D doctors usually prescribe for deficiency. Another rare compound not found in most foods, the amino acid L-ergothioneine—shown to protect cells against oxidative stress—is present in mushrooms. Though mushrooms tend to be free of E. coli. raw mushrooms may contain a naturally-occurring toxin called agaritine that is deactivated by heat, so mushrooms should be eaten cooked. Image Credit: decisiveimages / Thinkstock. This image has been modified.